A Catholic priest in the Philippines is to be investigated over possible links to the illegal trade in ivory, authorities say. Monsignor Cristobal Garcia was quoted for an article on the ivory trade in National Geographic magazine as giving advice on how to smuggle ivory statues. The article said ivory was widely used for religious artefacts in the country. Archbishop of Cebu Jose Palma said in a statement that Mgr Garcia should be given a "fair and just hearing". In the article, Mgr Garcia says that the best way to smuggle an ivory statue into the US is to "wrap it in old, stinky underwear and pour ketchup on it". The author writes that Mgr Garcia put him in touch with ivory carvers in the Filipino capital Manila. Mgr Garcia also suggests that papers could be obtained to certify a piece of ivory as an antique or an imitation and refers to "animal-nut priests who will not bless ivory". Another priest quoted in the article claims to know the smuggling routes through which ivory arrives in the Philippines from Africa. "We are looking at possible criminal liability here. We will be investigating their artefacts and how they were acquired," Sixto Comia of the National Bureau of Investigation told the AFP news agency. "This is very saddening that some of these priests may be involved in the illegal trade of ivory," he added. 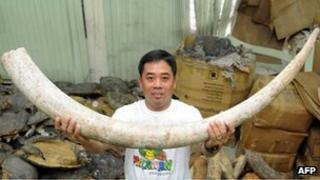 In 2005 and 2009, Filipino authorities made seizures of smuggled ivory amounting to thousands of kilos. Archbishop Palma emphasised that the church supports the international ban on trade in ivory and does not encourage its use for the manufacture of new implements. However, he added that artefacts "crafted long before the ban are considered the cultural heritage of the Church". A BBC investigation earlier this year found that the illegal trade is still flourishing, despite the 23-year international ban. Last year saw the highest number of large seizures of illegal ivory for more than two decades, with much of the trade geared to customers in China and other East Asian countries.